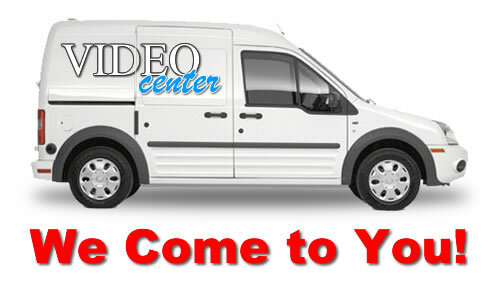 Video Center of Escondido TV Repairs, Electronics Repairs, We Come to You! (760)741-2300. We are proud to be the only Better Business Bureau A+ rated service center in North County. In business for over 40 years, we are the recognized as the best and most experienced TV repair in San Diego County. We also repair and service VHS decks, cassette decks, 8-Track decks, and Reel to Reel decks. Many repair shops will not repair or service these. Whether you come to us or we come to you, you can count on Video Center for honest, professional, and timely repairs. We service the North San Diego County area including Escondido, San Marcos, Vista, Rancho Bernardo, Poway, Penisquitos, Oceanside, Ramona, Valley Center, Rancho Santa Fe, Hidden Meadows, and surrounding areas. We also service tube style amplifiers, including Fender, Marshall, Pevey and others, vintage radios and TVs, and other electronics that are difficult to repair and impossible to replace. We having been repairing many of these units since they were new! We are factory trained we know how to repair your valuable electronics. We offer a FREE examination of your stereo at the counter while you wait. In depth diagnosis: If your stereo is valuable (or valuable to you) we will perform a complete diagnosis The fee for this is $69 which is deducted from repair costs. We provide only top quality repairs! Parts for vintage sets can be expensive and/or difficult to source, and this can take time... remember to be patient. *If your screen is cracked or broken, we recommend replacing the TV because repacement displays can cost as much or more than new TVs of comparable size and quality. **We service many brands including: Audio-Technica, Audiotronics, Bang & Olufsen, Beogram, Califone, Carver, Craig, Denon, Fisher, Hamilton, Kenwood, Marantz, McIntosh, NAD, NEC, Newcomb, Onkyo, Panasonic, Philips, Pioneer, RCA, Realistic, Sansui, Sanyo, Sherwood, Sony, TEAC, Technics, Yamaha and more.